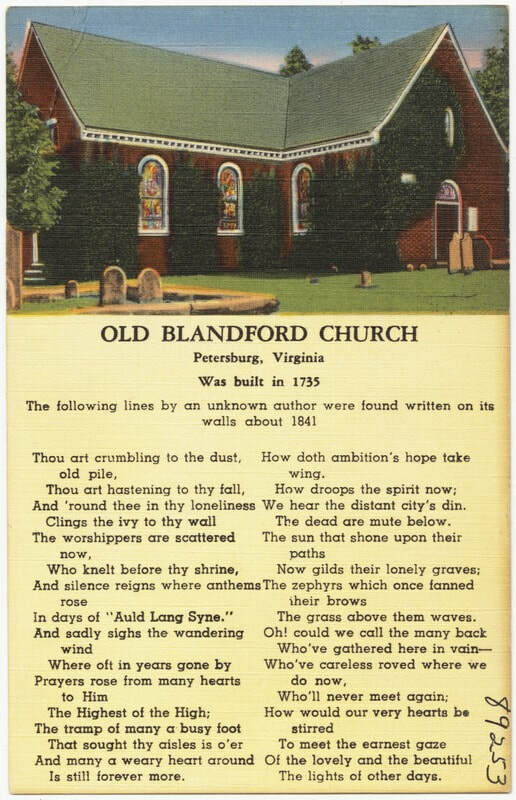 Blandford Episcopal Church was built in 1735 but abandoned in 1806 when a new parish church was constructed in Petersburg. By the time of the Civil War, the structure was an empty shell that sat atop what the Federals referred to as "Cemetery Hill." The Church, erected on the highest point overlooking the town, was a battlefield landmark. It was the objective point of the July 30, 1864 assault at the "Crater" after the explosion of a large Federal mine beneath Elliott's Salient on the slope below. During the first week of April 1865, after Petersburg fell to the Federal army, Timothy O'Sullivan and crew visited the church and captured at least three images, one of which was later reprinted by Alexander Gardner for his Photographic Sketchbook. "Blandford Church, Petersburg, Virginia / negative by T.H. O'Sullivan, positive by A. Gardner." O'Sullivan's assistant, "Vest Man," stands in the foreground with a soldier studying the lettering on a tomb. LC 00544. "Blandford Church and graveyard," Timothy O'Sullivan, photographer. LC 000543. "Blandford church and graveyard," photograph by Timothy O'Sullivan. Drawing by Edwin Forbes -- " The siege of Petersburg, Va. Advance of the Union on the right, near the Appomatox River, on the morning of June 18th, 1864. Showing the captured works and the part of the city near the river." The view is from the heights overlooking Harrison Creek. Blandford Church (red arrow) and Cemetery Hill dominate the skyline. Detail of Forbes' drawing (above) showing how Blandford Church and Cemetery Hill, overlooking the city of Petersburg, were key siege terrain. LC 1s04662v. 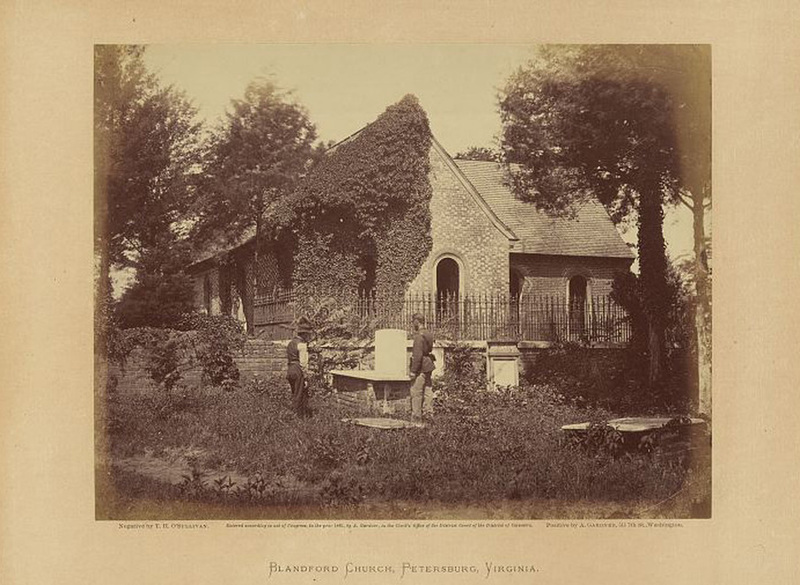 "Blandford Cemetery with Blandford Church," stereo by George Cook, a Petersburg photographer, circa 1885.